A comprehensive profile of a young fast-bowler from Peshawar who impressed in his debut season of domestic cricket with a brilliant haul of 33 wickets in just 5 first-class matches in the Quaid-e-Azam 2018/19 Trophy. I was born in a village near Peshawar and like many others, developed an interest in the game and started off with tape-ball cricket. But in all honesty, my elder brother, Saeed-ur-Rehman drove me towards cricket as he was enthusiastic about it. I used to watch him and some seniors in my school playing the game and that really had an effect on me as well. He did face some criticism from others in my family who were not happy that I had been pushed into cricket instead of pursuing education. I then started playing hard-ball cricket at the age of 11 in Peshawar Mazullah Khan Cricket Academy in 2011. As there was no Under-13 cricket in those days, I had no option but to try out for the Under-16s program run by the PCB in 2011 which was a chance I took as I was desperate to play good quality cricket at an early age. But it was not to be, and the same disappointment hit me again in 2012 where I failed to impress the selectors in the same trials. The situation in 2013 was worse as the PCB-PEPSI Cricket Stars Under-16 trials did not take place at all. In 2014, my luck changed as I was selected for the Imran Khan Talent Hunt program. Good performances in this program finally allowed me to find a place in the Peshawar Under-16s and I participated in the PCB-PEPSI Cricket Stars Under-16 Two Day Tournament in 2014 where in 3 matches I took 8 wickets at an average of 23.60. When I used to meet some of the senior players who had played Under-16 before, I noted that they had shirts with the word NCA written on the back. I knew this shirt could not be bought so I wanted to find out how I could get this shirt, so my coach told me that this was given to the players who were trained at the National Cricket Academy in Lahore and that I needed to work extremely hard to get there. I used that as a goal to motivate myself and in that year, 2014, was part of 46 top Under-16 players who were selected to train in the academy. I also knew from that point that I had to work doubly hard to get ahead of any of the other top performers and that became an obsession for me as I started to work in the gym and also on my fielding, in addition to my normal training. The success at Under-16 level really helped me understand what I needed to do in the future to get to the top but tougher tests were waiting for me in 2015. This was the year when I first played for Peshawar Under-19s in the Inter-District Under-19 Tournament where I just took 2 wickets. But in the next season in 2016/17, my performances were excellent. A lot of the credit goes to some advice from my seniors and coaches who told me to work hard and not be satisfied with just 2 or 3 wickets but to aim for more wickets. In the Inter-Region Under-19 Three Day Tournament, I took 25 wickets in 5 matches which included three five-wicket hauls also, then in the two-day Regional Inter-District Under-19 Tournament I picked up 9 wickets in 3 games. Then in the One-Day Inter-Region Under-19 Tournament I took 12 wickets in 7 matches. There was one disappointment which was that I could not be selected for the 2016 edition of the ACC Under-19s Asia Cup even though my performances were good and most of my friends were convinced that I would be selected. The disappointment of not playing for Pakistan Under-19s in the Asia Cup was now in the past and I got myself busy with the next season. This season proved to be even more phenomenal for me as I took 26 wickets in 5 matches in the Inter-Region Under-19 Three Day Tournament, but my 21 wickets in just 2 matches during the two-day Inter-District Under-19 Tournament was an amazing experience and I did feel like I was at the top of the world. Despite such good performances, I was not included in the 2017 ACC Under-19s Asia Cup which was a disappointment but that just made me work harder for the coming season. During the Inter-Region Under-19 Three Day Tournament in 2017/18, we were playing against FATA and I went to bat at the end with Shaheen Shah Afridi bowling to me. My coach had told me that you can hit any ball you like except the bouncer from Shaheen as that was really quick and difficult to hit. But, I did not pay attention to that and decided to take him on, which was a mistake as he hit me all over my body including my head but I refused to leave the ground as the team needed me to score runs and I guess I wanted to prove to my coach that I could bat as well. I helped the team to a good score in both innings and my team, Peshawar, also won the match but Shaheen’s bouncers still remain in my memory. I have a great interest in representing Pakistan in Test cricket as I feel that is the truest test of any player and so the chance to play First-Class cricket was one that I gladly accepted with both hands. My debut was against Islamabad where I managed to take 10 wickets in the match and as one can imagine, I was elated and I received praise from all my seniors. My favourite bowler and one that I admire and try and emulate is Mohammad Asif. Amongst the non-Pakistanis, Jimmy Anderson is the bowler I follow. I always watch videos of his bowling and even when he is playing against Pakistan, I am looking forward to seeing him take wickets although I get a lot of anger from my friends for saying that, but the fact is that I do admire his bowling. I am absolutely delighted to have been picked for the PSL’s Sixth Team. I will be part of a squad which will have some big names. I have only met Shahid Afridi and Shoaib Malik once and don’t really know them that well, so you can understand how excited I am about the chance of sharing a dressing room with such great cricketers. In fact, I have spoken to a number of people who say that Shoaib Malik is a great teacher and I am really looking forward to working with him in the PSL. Amongst the Pakistan bowlers, I will have so much to learn from the likes of Junaid Khan, Mohammad Abbas and Mohammad Irfan. So, for me this is a great opportunity and I cannot wait for this tournament to start. Hopefully, if I can get a chance to show my skills, I could get noticed by Pakistan selectors and get to play for Pakistan. 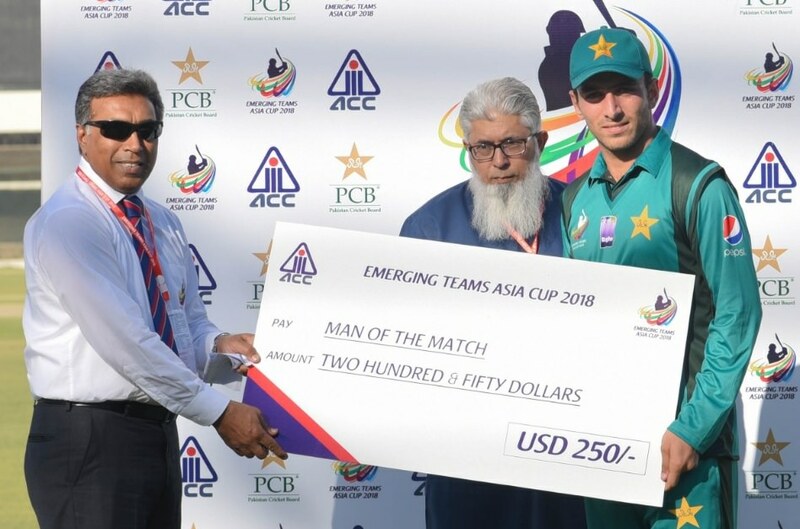 Being selected to represent the Pakistan Emerging side was great news but then to take 5 wickets recently including a hat-trick in my first game which was against the UAE was the icing on the cake. To do so well in front of our own crowds on our home grounds was really something special. I suppose my in-swingers did the trick with all batsmen being right-handers giving me an advantage too.